The outer circle was composed of 30 sarsen uprights with a similar number of lintels: this enclosed five sarsen trilithons (pairs of uprights with a lintel across each), arranged in a horseshoe shape, with the open end towards midsummer sunrise. Bluestones, which clearly had a special significance for the builders, were re-erected in a circle between the outer sarsen circle and horseshoe, and inside the horseshoe. 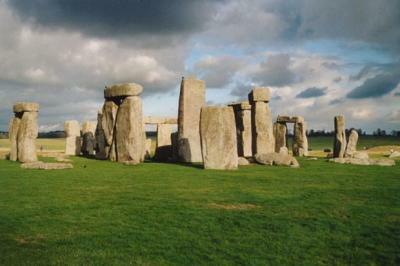 Some bluestones were later removed to leave the final setting, the remains of which can be seen today. In the landscape immediately around Stonehenge there are visible remains of many different types of monuments, and many more have been detected. 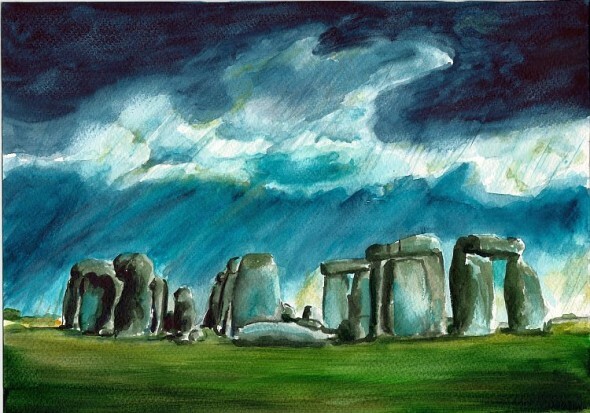 Neolithic monuments include long barrows, and the long rectangular earthwork to the north, the Cursus ( so called because it was once thought to resemble a chariot racecourse): together with the henge monuments at Woodhenge and Durrington Walls, contemporary with the middle phases at Stonehenge. The most numerous monuments are the remains of many Bronze Age round barrows, which were built after Stonehenge Stone Circle was complete. Stonehenge is a prehistoric monument located in the English county of Wiltshire, about 3.2 kilometres (2.0 mi) west of Amesbury and 13 kilometres (8.1 mi) north of Salisbury. One of the most famous sites in the world, Stonehenge is composed of earthworks surrounding a circular setting of large standing stones. It is at the centre of the most dense complex of Neolithic and Bronze Age monuments in England, including several hundred burial mounds. Archaeologists had believed that the iconic stone monument was erected around 2500 BC, as described in the chronology below. One recent theory, however, has suggested that the first stones were not erected until 2400-2200 BC, whilst another suggests that bluestones may have been erected at the site as early as 3000 BC (see phase 1 below). The surrounding circular earth bank and ditch, which constitute the earliest phase of the monument, have been dated to about 3100 BC. The site and its surroundings were added to the UNESCO’s list of World Heritage Sites in 1986 in a co-listing with Avebury Henge monument. It is a national legally protected Scheduled Ancient Monument. Stonehenge is owned by the Crown and managed by English Heritage, while the surrounding land is owned by the National Trust. 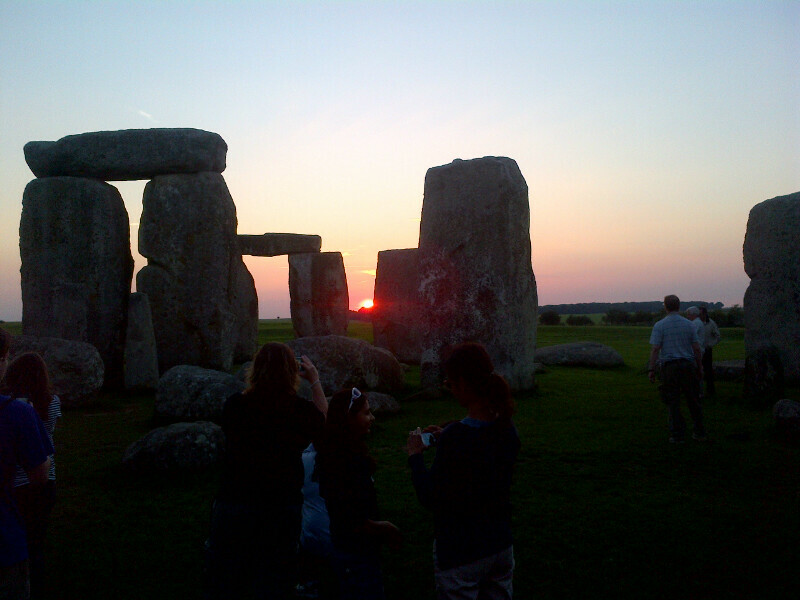 Stonehenge Access Tours – go beyond the fences! An opportunity to get close to the stones and learn more about the monument and the surrounding landscape. The visits will be led by David Dawson, Director of the Society, who will point out the main features of the circle and its surrounding landscape and explain the cycle of its construction and rebuilding during the Bronze Age. This is an opportunity to inspect and photograph (for non-commercial purposes only) the stones closely, and see the inscriptions, including the famous ‘daggers’ believed to date from prehistoric times, Wander at will inside the circle, indeed do whatever you wish other than touch, climb on the stones, picnic or play music, none of which is allowed! 23rd August (from 7.30pm to 8.30pm). Meet at Stonehenge car park 10 minutes before booked time. Tour lasts no more than one hour. Please note that special access is limited, open to no more than groups of 20 or so, and outside normal hours. Visits are either early mornings or evenings, and not every day (the English Heritage Website has details). The Celtic Harvest Festival – Lughnasadh – also known as Lammas – is a harvest celebration beginning at sundown on the eve of the 31st of July until sundown on August 1st and derives its name from the Irish God Lugh. In Wales, this time is known simply as Gwl Awst, the August Feast. 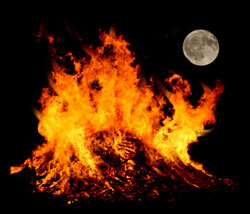 Lugh is associated with the power of sun and light, and so fires were burned in honor of Him on this day. In addition to His associations with light, Lugh is a God of Skill and Craft, a master of all human skills. On this His feast day, it is particularly appropriate that we celebrate our own abilities and skills. Lugh dedicated this Celtic festival to his foster-mother, Tailtiu, the last queen of the Fir Bolg, who died from fatigue after working and clearing a great forest so that the land could be cultivated. When the men of Ireland gathered at her death-bed, she told them to hold funeral games and celebrations in her honor. As long as they were held, she prophesied Ireland would not be without song. Lammas (was christianized as Lammas: the word ‘Lammas’ is an Old English word meaning ‘Loaf Mass’) celebrates the first harvesting of crops, the first of three harvest festivals. The Earth yields up Her first gifts to us … a blessing from the Mother and the product of our human hands. It is a time to celebrate the fruitfulness of the Earth and fruits of our labors. We have sown and nurtured, and now we are reaping the benefits in rhythm with the Earth. In later times, the festival of Lughnasadh, but in rural areas it was often remembered as “Bilberry Sunday,” the people would gather the earth’s freely-given gifts of black berries. As well people sang and danced jigs and reels to the music of melodeons, fiddles and flutes, and held uproarious sporting contests and races. Corn, grains and berries are of particular significance at this holiday (see recipes below from corn, flour and grains). Traditionally, the newly harvested grain is made into bread to be shared with all in this celebration. Fruits and vegetables are ripe and ready for canning and preserving. We celebrate and partake in the fullness of the Earth while beginning to make provision for the cold months ahead. This was also an occasion for handfasting and displaying of their skills and specialized crafts. Through the centuries, Ireland’s country-people have celebrated the harvest at revels, wakes and country fairs. 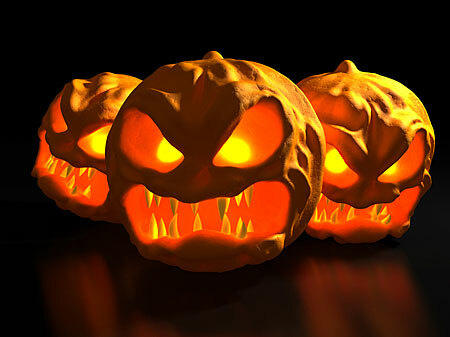 Some still continue this festival today with an entertaining manner and it is usually celebrated on the nearest Sunday to August 1st, as so that a whole day could be set aside from work. It is a time to ask ourselves: “What are my talents? What are my skills? How do I express my creativity? How do I use my abilities to re-craft my world … to add beauty …. color … richness? Our skills may include woodworking, designing, creating, sewing and needlecraft, art, music, dance, sports or communication, organizing, healing, parenting, problem solving etc. Whatever our talents or abilities, this is a time to recognize them and honor them, and to share our recognition of the talents and abilities of others around us. If you have had an interest or urge to develop a particular skill or creative outlet, now might be the time to make a pledge or commitment to yourself to pursue your interest. By offering the fruits of our labors back to the Universe we enrich both ourselves and our world. Because Lughnasadh is a celebration of the new harvest, people cooked special ritual foods and festive meals. If you are curious about this historic celebration and the abundance of foods prepared, please search the internet. It is a wonderful time to celebrate the abundance we receive from mother earth and be with our special loved ones. Lammastide was the traditional time when craft fairs and pageants were held. Long Summer evenings are beginning to get shorter. In Ireland Lammas is traditionally a time for buying and selling, horse trading and music. The ‘Oul Lammas Fair’, Ireland’s oldest traditional market fair, which takes place in Ballycastle, Co Antrim on the last Monday and Tuesday in August, attracts people in their thousands at festival time. Saint Catherine was celebrated – ‘ The Catherine Wheel’ came from the Pagan rites when a wagon wheel would be tarred, set on fire and rolled down a hill – symbolizing the decline of the Sun God as the seasos wheel turns to Autumn Equinox. If the wheel went out before it reached the bottom – poor harvest, abundant if it remained lit. St. Ciaran’s Well, Clonmacnois, County Meath – pilgrims go with torches at midnight on the first sunday in August – looking for a trout. The sun was believed to live in holy wells during the night. Celts erected temporary hills to celebrate the harvest festival of Lammas. 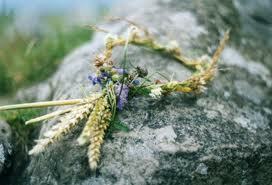 In Ireland a girl would be seated on the hill-top, garlanded with flowers and proclaimed the goddess of the hill. Celts would climb hills to pray to the gods and gather bilberries at Lammas. The raising up of Celtic crosses onto stone steps recalls the Lammas tradition – Perrons – a type of man-made holy terraced mountain. Making of the Corn Dolly from the best ears of corn taken from the last sheaf to be harvested. This was usually kept hanging over the hearth to bring good luck, and the seeds were added to the new seeds in the Spring. THE discovery of a Stone Age temple on Orkney looks set to rewrite the archeological records of ancient Britain with evidence emerging it was built centuries before Stonehenge. Archeologists have so far found undisturbed artefacts including wall decorations, pigments and paint pots, which are already increasing their understanding of the Neolithic people. Experts believe the huge outer wall suggests the site was not domestic, while the layout of the buildings has reinforced the view it might have been a major religious site. 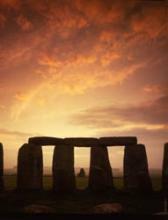 Archaeologists think the temple was built 500 years before Stonehenge, regarded as the centre of Stone Age Britain. However, only 10% of the site at Ness of Brodgar has been excavated and it could be years before the scale and age of the discovery is fully understood. It sits close to the existing Ring of Brodgar stone circles and the standing stones of Stenness, near to the town of Stromness. The uncovered wall around the edges of the site was built with 10,000 tonnes of quarried rock and may have been up to 10 ft high. 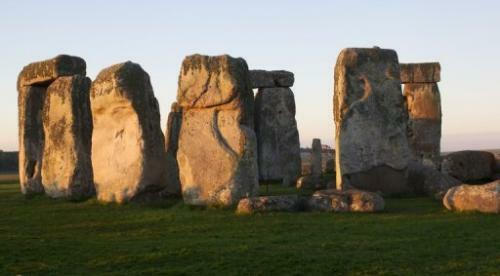 Thermal technology also indicates the site could cover the same area as five football pitches, with some parts potentially older than Stonehenge, in south-west England, by as much as 800 years. Charcoal samples from beneath the wall indicate it was built around 3200 BC. A 30mm high figurine with a head, body and two eyes, and called the “Brodgar Boy”, was also unearthed in the rubble of one of the structures. About 18 months ago, a remarkable rock coloured red, orange and yellow was unearthed. This is the first discovery in Britain of evidence that Neolithic peoples used paint to decorate their buildings. Project manager Nick Card said the discoveries are unparalleled in British prehistory and that the complexity of finds is changing the “whole vision of what the landscape was 5000 years ago.” He said it was of “a scale that almost relates to the classical period in the Mediterranean with walled enclosure and precincts”. Mr Card added: “It’s a huge discovery; in terms of scale and complexity there really is nothing else quite like it.